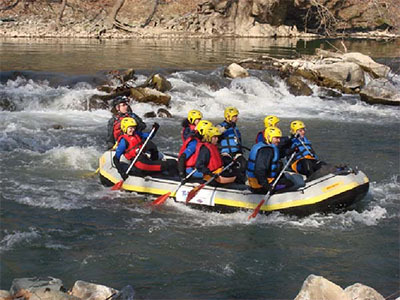 Descend of rivers with inflatable boats (RAFT) for 8 individuals and a professional driver Raft. A way of exceptional beauty in one of the most important natural monuments of our place with wealth of fables, the Valley of Tempi. We will enjoy the nature in all the greatness, ancient trees where find shelter many species of birds, stahtotsikniades, herons, flamingos, cormorants. We will pass under the famous bridge of the Valley of Tempi. We will pass also near ancient places of adoration. Here the god Apollo chases the nymph Laurel, Venus comes each time when she wants to recover her chastity and the Likeios Apollo overcomes in the river the Dark, while the Muses select Penaeus for their residence. It includes: All necessary technical equipment, experienced Guides, local transfers, picnic, third party insurance. What you should have with you: Second pair shoes (which will be wetted), swimsuit or halves underwear, a personal towel, small rucksack for personal objects, appetite for amusement and good disposal! We provide all kinds of professional tourist services for groups and individuals, mainly from Czech and Poland, arriving to the regions of Pieria and Thessaly.